In November 2017, junior Xueying “Shelley” Chen attended the Clinton Global Initiative University in Boston. There, she networked with other social innovators and learned about the importance of serving the community. Read more about her and CGI U here. In November 2017, I had the opportunity to join 1,000+ change-makers at Northeastern University for the Clinton Global Initiative University (CGI U). CGI U brings together world leaders to take action on global challenges in five focus areas: Education, Environment and Climate Change, Peace and Human Rights, Poverty Alleviation, and Public Health. Each year the meeting brings together students who are devoted to their “commitment to action,” defined as new, specific, and measurable initiatives that address pressing challenges on campus, in local communities, or around the world. My commitment to action is to provide sustainable eye care to the Tibetan refugees who currently live in Northern India. My team competed in the 2017 Tibetan Innovation Challenge and we were one of the global finalists in the competition. We created a business plan to host a writing competition among all the Tibetan refugee high schools; for our plan, the Tibetan high schoolers submit children’s stories to the competition and we select the best ones and publish them on Amazon. The revenue generated from the book sales is then used to provide modified sunglasses to prevent an eye disease called “black eye” that is prevalent among Tibetan refugee children in Ladakh. 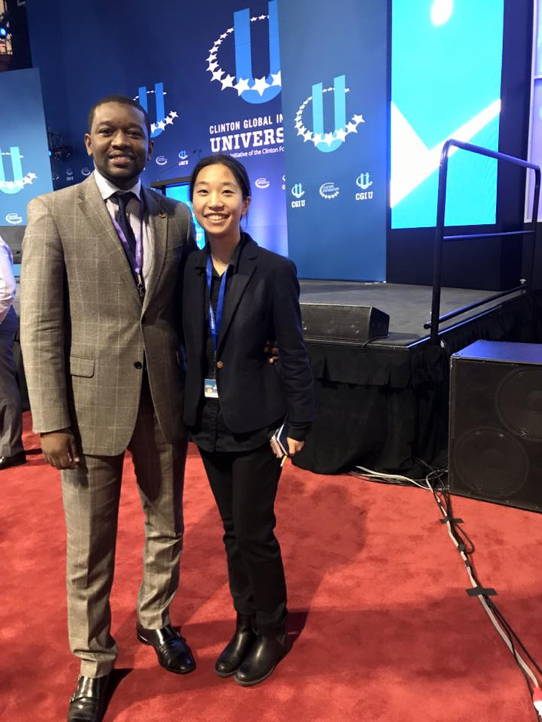 Xueying “Shelley” Chen ’19 with mentor Jean Laurent (founder of Unspoken Smile Foundation) at CGI U 2017. Before I went to Boston, I started chatting with CGI U attendees on Facebook. Some of them are in the early stage of initiating their social venture. Some of them already have a successful operating non-profit or social enterprise. I was also assigned a mentor, who is the founder of Unspoken Smiles Foundation, a non-profit organization that provides dental critical dental health issues in developing countries. The first day at CGI U, I attended two keynote speaker panel sessions and two small-group discussions. The keynote speakers were former President Bill Clinton, Ibtihaj Muhammad (Olympic medalist, activist, and entrepreneur), David Miliband (President and CEO of International Rescue Committee), and Anndrea Moore (Founder and CEO, Black Tech Women). The topics covered were climate change, immigration policy, human rights and the opium crisis. At the end of day, there was a networking event where student displayed their projects through oral or poster presentations. The second day, I was assigned to a community service site to paint murals for a family center. From the community service project, I had a better understanding of the communal engagement in Boston. Through CGI U, I had a fruitful experience exchanging ideas with like-minded student entrepreneurs, with whom I am still in touch. CGI U was a confirmation to the world that young people are striving to make a positive change through their commitment to action. It is a global community that came together to improve 180 million lives in 180 countries. I am grateful for my CGI U experience because it opened my eyes to resources that are out there to help students start their social entrepreneurship projects. I was able to connect with like-minded student entrepreneurs from all over the globe. Now, it’s your time to join this movement of change! Xueying “Shelley” Chen is a junior double-majoring in International Relations and Business at the University of Rochester. She is an aspiring social entrepreneur and an social innovator; Chen is always looking for ways to create a positive impact in her community and around the globe. She is an avid advocate for human rights and gender equality. In the past, she led a team to compete in Tibetan Innovation Challenge and was one of the global finalists. This spring, Chen is competing in the Hult Prize Competition, the world’s largest social entrepreneurship contest, with a team of global citizens hoping to commercialize nano-membrane toilets. She believes there is a way to bridge the gap between the public sector and private sector, and ultimately wants to empower youth to make a positive difference in the world. Each fall, the Ain Center welcomes visiting faculty from Romania to explore entrepreneurship. Alma Pentescu, a member of the 2017 cohort, shares her “wonderful, perspective-changing” experiences at UR. Last year a “new chapter of my life” was to be written. As a proud winner of a Fulbright-RAF award, I had the opportunity to spend a semester in the United States of America. As a teaching assistant and marketing Ph.D. at the Lucian Blaga University of Sibiu – The Faculty of Economic Sciences, I teach marketing and trade related subjects. However, this opportunity emerged due to the fact that my colleagues and I work on developing entrepreneurship education at our university. Thus, in order to find out more about how an entrepreneurial ecosystem works, how to build one and how to adapt to an ever-changing environment, I went to the Ain Center for Entrepreneurship – University of Rochester, NY. During my stay in Rochester I did so many interesting things. I took the Upstate New York National Science Foundation I-Corps short course as well as two other courses, spoke with different professors; attended pitching/business plan competitions and various speaker series; been to conferences on entrepreneurship topics; took part at the meetings of Excell Partners, Rochester Angel Network, the Finger Lakes Regional Economic Development Council; attended different events (organized by students, alumni or the community), both professional and for leisure. I traveled to New York, Massachusetts, Pennsylvania, Illinois and beyond, and have seen several entrepreneurship centers, as well as incredible places. I had a glimpse of the American life by attending different events such as the Clothesline Festival, Rochester Philharmonic Orchestra’s concerts, The Blue & Gold Gala, Thanksgiving and others. The United States of America are well known for entrepreneurship, entrepreneurship education and research. Being able to learn from such experienced people about how they started their entrepreneurial initiatives, how they’ve grown, what worked for them and what didn’t was a huge opportunity for me and my colleagues (the ones in this program as well as the ones at my university). But it wasn’t just about the things I’ve learnt. The main benefit came from the people I’ve met. Kind and willing to share their knowledge, ideas and experience. Thus, I want to thank all the inspiring people I’ve met thanks to this award and to all the wonderful people who made this opportunity possible. This is not the end of the story, but, hopefully, the beginning of a fruitful collaboration.